. : chromewaves.net v7.5 » Blog Archive » The National have a new album and are headlining NXNE. Your argument is invalid. 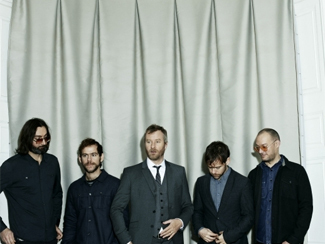 The National have a new album and are headlining NXNE. Your argument is invalid. Deirdre O’CallaghanSometimes the best kinds of surprises are the ones you already knew were coming. For example – everyone knew The National was making a new record. High Violet came out way back in Spring 2010, touring behind it wrapped in late 2011, and they’ve since been posting updates from the studio via Instagram. Everyone knows they’ve not been idle, and yet it was hard not to feel a shiver when the official press release arrived in the inbox, announcing the album was done and would be out in May. No other details about the release like title or precise release date, but for now it was enough. Well, almost – it also revealed some Spring/Summer tour dates including the fact that The National would be the Yonge-Dundas Square headliner at NXNE. I had wondered why NXNE was making their first official festival lineup announcement so early – last year’s Flaming Lips reveal didn’t come until mid-April – but I guess when one of your biggest act is going to let the cat out of the bag anyways, why not get on board? And so you can officially circle Friday, June 14, on your calendar as that evening The National will perform a free show for anyone and everyone who cares to listen at Yonge-Dundas Square. It won’t be the multi-sensory spectacle as The Lips offered last year, but it will be gorgeous, showered, and blue-blazered. A whole batch of acts was announced alongside The National with some of the other high-profile acts coming to town including: Tuscon desert-rock stalwarts Calexico at The Mod Club on June 12, which explains why they’ve taken so long to come to town behind last year’s Algiers; Copenhagen post-punks Iceage at locations to be determined on June 15 and 16, which is why their current tour behind You’re Nothing has a curious Toronto-shaped gap in it despite there being time and space to fit it; one of the two Black Flag reunions – FLAG, featuring Keith Morris and Chuck Dukowski – are at The Opera House on June 14; ascendant Californian garage-rocker Mikal Cronin, whose second album MCII is out May 7, assumes the Silver Dollar residency from June 13 to 15; and the touring bill of Milk Music and Merchandise will play showcases perhaps together, perhaps not. It’s interesting that with a couple exceptions, most of what was announced yesterday tends to the loud, punk side of things. Perhaps the festival just wants to make an impactful first impression? Certainly did for me, and they’ve got almost four more months to roll out some more rangy acts. Can’t wait. Austra took to Twitter to announce themselves as a rather late add to Canadian Musicfest; they’ll be playing The Danforth Music Hall on the evening of March 23. Austinist has an interview with frontwoman Katie Stelmanis. Stepping out of festival-y stuff for a moment, I’m excited that Stornoway are at The Horseshoe on May 9 in support of their second album Tales From Terra Firma, out March 19. Tickets for that are $15 in advance. The Toronto Urban Roots Fest continues to make good on their promise to reveal a few more acts every week; this week’s adds to the four-day fest at Garrison Commons from July 4 to 7 include The Hold Steady, Justin Townes Earle, Frank Turner, The Lowest Of The Low, and The Skydiggers. Info on which specific date each act is playing and ticket on-sales are still a few weeks out, but if the festival’s intent is to keep building excitement each week until it lets details out… I think it’s working. And not a festival, but still sort-of keeping in theme as a new addition to an existing event and happening on an outdoor stage… more than a month out from their Sound Academy show, and Alt-J have already announced a return engagement on September 11 at Echo Beach, tickets $34.50 general admission and $50 VIP. And in non-concert announcement business… Low have made another track from The Invisible Way available to download. They play The Great Hall on March 16 and the album is out March 19. Yeah Yeah Yeahs have made the first single from Mosquito available to stream, largely putting to rest fears that the album art would accurately reflect the contents. It’s out April 16. Rolling Stone has a stream of another song from the new Iron & Wine album Ghost on Ghost, out April 16. Clash talks to Jim James, paying a visit to The Phoenix on April 24. NPR has a World Cafe session with Beach House. There are two times in my life where the first time I saw a band perform live, it blew my mind and made me beevile in the power of music: one was the Constantines and the other was Weeping Tile. They opened for The Gandharvas at York Univ…ersity and I was totally and completely smitten. I’m pretty sure I wore out my cassette copy of Eepee. I talked to Sarah after the show and she was as nice as pie. And when they played a free show at the UC a few months later, I asked if I could interview her for CFRU and once again she was super nice and a great interview. And when Weeping Tile played Hillside a year or so later and I got to interview her again (with the addition of the equally awesome Mary!) she remembered me from the CFRU interview and again was just lovely. I am sooooooooo excited about the show next week, Mr. Barclay. Thank you for bringing Weeping Tile back into my life. Yay!! !